On March 22, Secretary of State Rex Tillerson hosted foreign ministers and senior leaders from 68 countries that make up the Global Coalition working to defeat ISIS. This meeting took place at the Department of State in Washington D.C. It was the first meeting of the full Coalition since December 2014. 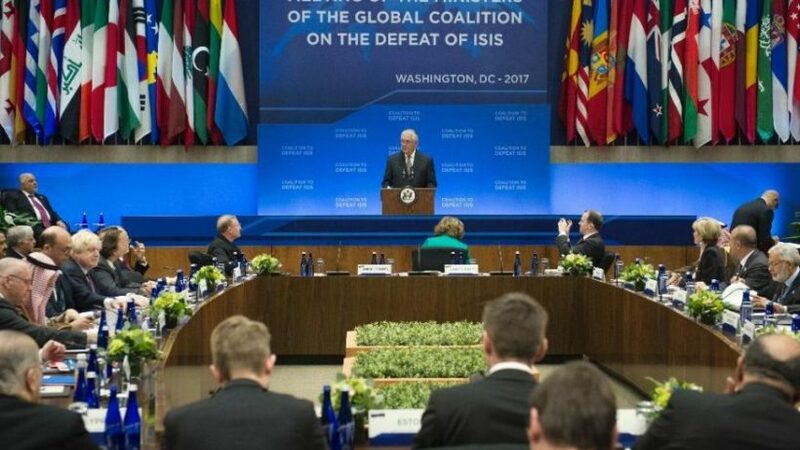 (compiled from reports at Los Angeles Times, CNN, RT, VOA News and Reuters) – U.S. Secretary of State Rex Tillerson is hosting a meeting of the 68-member US-led coalition against Islamic State (IS, also known as ISIS/ISIL). The Washington, DC summit is the first meeting of the full coalition since December 2014. The Obama administration did not meet with the full coalition during the last two years of his presidency. President Trump signed an executive order on January 28 directing his national security team to come up with a strategy to defeat the group. 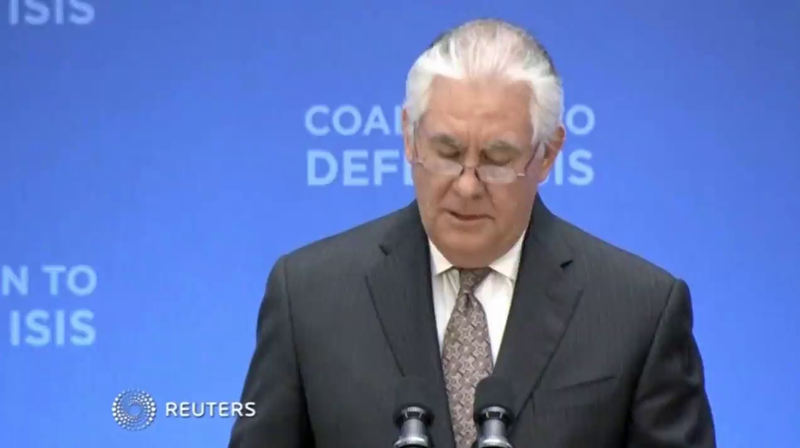 The president promised to “demolish and destroy” ISIS, Tillerson told the coalition envoys in his opening remarks. Secretary Tillerson said the coalition had made significant progress against the terrorist group, with the flow of foreign fighters into the region down by 90 percent and Islamic State online content down by 75 percent. Turkey has pushed ISIS back from the border, while in Iraq, government forces and Kurdish Peshmerga are working together to liberate Mosul. Defeating the terrorist group is the “number one US goal in the region,” Tillerson said, adding that the coalition will focus on “regional elimination of ISIS through military force. As a coalition, we’re not in the business of nation-building or reconstruction,” Tillerson said, adding that resources should be focused on preventing the resurgence of ISIS and equipping war-torn communities to rebuild. The US is currently providing 75 percent of coalition military resources in support of local forces in Iraq and Syria, the secretary of state said, adding that for humanitarian efforts, the proportion is reversed. “The US will do its part, but the circumstances on the ground require more from all of you,” Tillerson said. Coalition forces will remain in territories claimed by “the fraudulent caliphate” to ensure stability, Tillerson said. While he gave no further details, any coalition military presence inside Syria is seen as unacceptable by the government in Damascus, which – unlike Baghdad – did not invite the US-led forces into the country. Syria’s President Bashar Assad instead works with Russia to fight moderate rebels instead of waging war against Islamic State fighters. The Coalition’s foreign ministers were scheduled to discuss the priorities in the struggle against the terrorist group, from military efforts and the ongoing humanitarian crisis in Iraq and Syria to “counter-messaging and stabilization of liberated areas,” the State Department said in a statement. 3. What progress has been made so far in the fight against the Islamic State? 4. What is the Trump administration’s main goal in the fight against ISIS? 5. For what reason is Secretary Tillerson asking the more than 60 coalition partners to contribute more financially? 6. a) What does the coalition need to do beyond the battlefield, according to Secretary Tillerson? b) What did the Secretary urge coalition members to do going forward? 7. The media outlets that reported on this meeting noted that Tillerson did not give details on specifics in the effort to destroy the Islamic State. a) What reason could there be for the U.S. to refrain from giving specific details of the plan? b) Ask a parent: Trump and Obama have very different leadership styles. Obama famously “led from behind” and referred to ISIS as “the JV team.” Trump has set out to fulfill all of the promises he made during his campaign. He appoints the people he thinks will best carry out the jobs. Do you think the U.S. and our coalition partners will be able to successfully destroy the Islamic State organization with Donald Trump as the president or did President Obama have a better strategy for dealing with ISIS? Please explain your answer. The Pentagon has about 5,200 troops in Iraq and 1,000 in Syria. They rely on Iraqi security forces and Kurdish guerrillas in Iraq, and U.S.-backed rebel militias in Syria, to carry out combat operations, while the U.S. and its allies provide intelligence, launch airstrikes and fire artillery to support the ground attacks. Over the last year, the combined attacks have pushed out the Sunni militants from most major cities in Iraq. Despite a five-month U.S.-backed assault, heavy fighting is still underway to retake the group’s remaining stronghold in Mosul, Iraq’s second largest city. The challenge is tougher in Syria, where the Pentagon has backed the Syrian Democratic Forces, a coalition of mostly Kurdish rebel groups that operates chiefly in northern Syria. Preparations are underway for an assault on the Islamic States’ self-declared capital of Raqqah. Long-term challenges will be to rebuild the cities and towns destroyed by Islamic State during their occupation, or by coalition bombardments that sought to dislodge them. Tillerson will ask other coalition nations to invest in the recaptured areas and to help provide humanitarian aid and other resources for the millions of people displaced in the fighting. “We will continue to facilitate the return of people to their homes and work with local political leadership,” he said Wednesday. Read President Trump’s January 28 executive order directing his national security team to come up with a strategy to defeat ISIS.